Museum digitisation specialists are working with Ecotourism and Conservation Society Malaysia (ECOMY). The team is aiming to digitise representative specimens for 5,000 species across a range of taxonomic groups. The focus will be on insects such as damselflies, dragonflies, praying mantids, grasshoppers, locusts, crickets, stick insects, moths and beetles. Data will be available to download via the Museum's Data Portal, and a copy will also be stored in Malaysia. The Museum is on a mission to digitise everything in its collection – all 80 million specimens. Natural history collections around the globe hold information critical to tackling fundamental scientific and societal challenges. Digitisation will help to render this information accessible to scientists, researchers, data analysts, citizen scientists and students from all over the world. The Museum's Digital Collections Programme was initiated in 2014 to digitise objects and specimens in the Museum’s collection and openly release this data. Digitisation experts received funding to make a start on the Malaysian entomology collections this year. It has become a collaboration between staff in London and their counterparts at ECOMY. This project began last August and is due to be completed in June 2018. 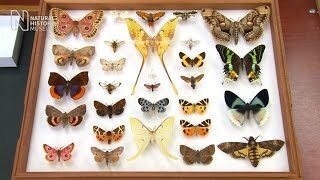 The Museum houses the oldest entomology collection in the world, boasting more than 34 million insects. Louise says, 'Due to the wide variety of insects that we are imaging, our setups need to be adaptable to cope with the size range of specimens, as well as being able to image multiple views. A side view of an insect compared to a top view will show different diagnostic characteristics which are important to capture. To find out more, read the latest blog post.